Beijing: In an incident of major violation of rules, a pilot of China Airlines was found sleeping in the cockpit while flying a Boeing 747. Weng Jiaqi is a senior pilot with almost 20 years of experience and the video of him snoozing mid-air was taken by a co-pilot. 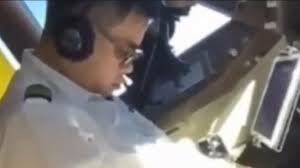 The 30-second video, which went viral, showed the sleepy senior pilot leaning his head forward and his eyes closed while the plane was mid-air. Soon as the video reached social media platforms, netizens got angry and criticized Weng for putting the lives of his passengers into danger. Following this, the airlines have informed the media that the pilot has “received adequate punishment” and disciplinary actions have been taken against him. “In this instance, the pilot himself voluntarily reported his inappropriate behavior in the cockpit to China Airlines,” China Airlines said in a statement. It further said that the co-pilot has also been reprimanded for not waking up the senior pilot. “If the pilot (Weng) was really too tired, he should have alerted crew-members and have them observe his condition,” the pilot added. According to the aviation guidelines in Taiwan, pilots are allowed to sleep in the cockpit if the flight are long- something known as ‘controlled rest’. For this, the seat needs to be pulled back and the pilot is not anywhere near the controls. The video comes to light days after the China Airlines’ pilots shut a seven-day strike over issues including long working-hours and pilots experiencing fatigue. It ended with an agreement between the airline and the Taoyuan Union of Pilots about addressing complaints about pilot fatigue and overwork. According to Civil Aviation Bureau, pilots should be given at least 24 hours off if they’ve flown over 12-hours. Next articleRwanda begins 100 days of mourning for over 800,000 people slaughtered in genocide.